Longboarding is quickly rising in popularity and since its start from skateboarding, has developed into an entire sport of its own. For beginners looking to buy their first board though, it can be hard to find the right longboard among all of the top brands, different lengths, and different parts that each longboard is made up of. Before I get in too deep into longboarding, I always like to just place my personal favorite longboards at the top. 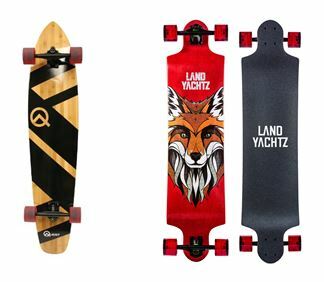 For readers who are simply looking for a longboard that looks cool or a basic starter longboard you can’t go wrong with any of these! For riders who want to know why these longboards are so good, keep reading. Light Downhill Check Price Now! 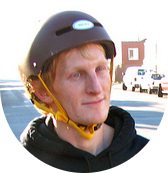 Hi, I’m David, and I’m here to be your guide through the crowded longboarding market. You’ve already seen my top picks but why should you listen to me? Growing up as a skateboard kid, I liked doing tricks but I didn’t like how long it took me to pick up new ones. When I heard about longboards, I switched over and I loved it from the start. Now 4 years later and after buying a number of different longboards, I came to realize that there really isn’t a good place online to find advice for beginner longboarders. 4 What is a longboard? Looking back, the first board I picked up was TERRIBLE for what I actually wanted to do with a longboard! This website is for me to give advice to young me when he first said that he liked longboarding. There are how to guides on beginning longboarding and over 75 different reviews of common longboards that you might be interested in. Listen up, this is literally the most important part of the article. Longboarding is mainly divided into 3 main styles and the perfect longboard for you will be determined by what riding style you want. Cruising longboards are typically used as commuting or simply fun-to-have longboards. After all, longboarding is a lot easier than walking and who doesn’t like to take it easy? Somebody who wants a cruising board simply wants to get from point A to point B without walking. Cruising longboards typically have a stiff deck, loose trucks, and hard wheels. Also common is a short length of anywhere from 30 to 40 inches. These different aspects come together allow a slim turning radius for these longboards which allows riders to make those 90 degree sidewalk turns and go through crowds easily. Cruising boards are designed to kind of feel like surfing on land. They aren’t meant for extremely fast speeds or for doing fancy tricks but they’ll give you a great riding experience on a longboard. Key Aspects: Transportation, Leisurely Strolls, Carving – show 3 great cruising longboards. Small and light, the Quest Super Cruiser was designed to be the best option for cruising and carving anywhere. Check Price Now! The Sector 9 Lookout is great for riders looking for a great cruising board with the possibility to do more. This board carves amazingly and yet also functions well on small hills. Check Price Now! With a light and small deck, the Sector 9 Shoots provides an amazing carving experience, often times making tighter turns than the Super Cruiser. Check Price Now! Were you ever a skateboarder who hung out in the skate park all day trying new tricks? If so, you might be like becoming a freeride longboarder. This longboarding style mainly relates to doing tricks on longboards. Sliding is generally included in this category.Most freestyle longboards have lowered decks to make initiating a slide easier for beginners although there are some exceptions. I also like to include dancing in this category of longboarding. Dancing involves doing tricks on the deck of the longboard. An example of a trick would be cross stepping up and down the length of the longboard deck. Typically more advanced riders get into dancing as it is a little more complicated than basic freestyle method longboarding. Key Aspects: Doing Tricks, Sliding. The Landyachtz Switch provides a stable base for riders while remaining felxible enough for easy carving and downhill rides. Check Price Now! With a flexible deck, the Arbor Axis is perfect for cruising and carving purposes. Perfect board to practice dancing on. Check Price Now! A great freeride board that is also affordable, the Volador Freeride Longboard provides just enough space to make tricks as easy as possible. Check Price Now! This for the riders who want to go fast, the ones eyeing their local hills just waiting for their longboard to arrive. These longboards typically feature a longer and lower deck for added stability. If you want some inspiration, look up the fastest somebody has ever gone on a longboard. They clocked him at over 80 mph. Now, you can’t go over 80 mph on any simple longboard. Downhill longboards have special characteristics which make them more stable at higher speeds.Most of the best downhill longboards are characterized by their stiff deck and low clearance to the ground. The low center of gravity of the longboard helps keep them stable at higher speeds. For beginners, you should definitely look into a longboard with a stiff deck or a drop down board. While with cruising and freestyle boards, you can get a decent longboard under $100, don’t try that with a downhill longboard. The best downhill longboards will be a little pricier but that is the price you pay if you want to go fast. Do you want be going at 30mph when your board just breaks underneath you? Buying a little more expensive board now will save you a lot of time and money in the long run. Part of the Downhill Division from Sector 9, the Brandy provides a stable base to hit high speeds. Check Price Now! With a low center of gravity, the Faultline is perfect for bombing hills. Check Price Now! Riders are able to wedge themselves into this longboard and hit top speeds that'll make them go back in time. Check Price Now! Let’s take a second to address the most common issue I get asked: But David, I don’t know what I want to do with my board, I just want to ride. Or… David, none of these styles seem to fit me, what board should I get? As with anything, these styles are broad categories. Just because you might wait to cruise around today but do downhill riding tomorrow doesn’t mean you need 2 completely separate boards(for the pro’s it might). As shown in my top longboard picks, there are a number of boards which excel at more than 1 category. Check here if you want more in-depth information on the best longboard for you. A longboard is essentially a long skateboard. Seems simple right? Longboarding came out of skateboarding as more riders got into the sport and realized they did not simply want to do tricks. These riders wanted to go fast. In order to do so, the longboard was born. Longboards can range from 30” all the way past 45” and generally the longer the deck is the more stable and faster the longboard can go. Longboards are made out of 3 separate parts(we’ll talk about them in detail a little later) which are the deck, the trucks, and the wheels. Each one affects how the final board rides. The most important aspect in longboarding is your choice of board and parts. If buying a complete board, you want the entire package: good trucks, good wheels, and a good deck as a base for the components. Buying individual parts, you can tailor the board slightly more to your needs by choosing specific trucks if you want to start fast downhill or different wheels if you want to start sliding. Regardless of which you want to do, you have to accept one thing: there are a lot of different parts that go into a longboard and there are a ton of different options for each part. I’m going to explain each part in detail and if you have any questions simply let me know through the contact form! The only way you are going to build the best longboard is if you keep the end goal in mind. Do you want a light and nimble cruiser for daily use? Simply remember that when reading this and I’ll give you all of the answers you need. The biggest part of a longboard is also one of the most important: the longboard deck. The best longboards will have a longboard deck that fit’s their style of riding. Board Shape is the very first thing you should look at in a longboard deck because it determines which way you can ride your longboard. If a longboard is directional(a pintail longboard such as the best-selling Quest Super Cruiser is a great example), it can only be ridden in one direction. The Quest Super Cruiser (left) vs the Landyachtz Switch (right). See the difference in shapes. If your longboard deck is symmetrical (the Landyachtz Switch comes to mind as a good example) the longboard can be ridden both ways. The only advantage of having a symmetrical board is being able to ride it both ways. This comes in handy if you start sliding your longboard as you’ll end up pointing the wrong way at the end of it. In terms of different board shapes for different styles, almost every simple cruising longboard and some of the best longboards for downhill will be directional. Freestyle longboards are usually symmetrical simply because of the tricks. The deck style is the second most important aspect to look for when choosing a deck for the best longboard. The style of a longboard deck influences the stability of the longboard, how easy it is to push on flat ground, and how well it carves. The deck style primarily influences the center of gravity of the board(ie. how far the board is off the ground). The higher the longboard is off the ground the less stable it is and the harder it will be to push for long distances. The tradeoff is that higher longboards typically are better at carving than lower longboards. There are 4 styles which I’ll talk about. For reference, the deck style refers to how the truck is mounted to the longboard deck and how its position relates to where the rider stands. Top Mount Longboards – Usually the cheapest longboard deck shape, in this configuration the longboard deck is mounted directly on top of the trucks. This means the center of gravity is high which creates a nimble longboard great for cruising or carving. A great cruising longboard and a top mount is the Quest Super Cruiser . Drop Through Longboards – As the name might suggest, the trucks are mounted through the longboard deck in the drop through configuration. This means that baseplate of the truck sits above the deck while the rest of the longboard truck is below. This creates a stable board for beginners and also helps you push the board further because the longboard is closer to the ground. This style is great for long distance commuting, downhill and freeriding. My first longboard was a drop through longboard and I think it still remains the perfect mix of stability and speed for beginners. My first longboard and a great drop through longboard is the Atom Drop Through Longboard . Drop Deck – Drop Deck longboard decks have almost an extended U-shape. The ends of the board sit higher than the middle of the board resulting in a low center of gravity and a highly stable longboard. The trucks are top mounted in the drop deck configuration. This type of longboard is amazing for downhill because the drop protects the rider and allows the rider to wedge his feet into each side. My suggestion for a solid Drop Deck longboard would be the Landyachtz Switch . Double Drop – This configuration is not as common as the other three. It is a combination of the drop down style and drop through. The ends of the deck are again higher than the middle but the trucks are mounted in a drop through configuration making the board the lowest out of any longboard deck style. This is more difficult to construct than the other deck styles leading to it being less common and more expensive. This deck style is used almost exclusively for downhill. While the longboard deck style and board shape are the main characteristics to help you choose a longboard deck, there a number of other important characteristics such as length, board construction, flexibility, kicktail vs. no kicktail, and others which I don’t cover in this guide. If you want more information check my in-depth guide to choosing a longboard deck here. It goes over absolutely everything you need to buy your next longboard deck. Besides the deck, the longboard trucks are perhaps the second most important piece of any longboard. Longboard trucks are the T-shaped piece of metal that connects the deck of the longboard to the wheels. Mainly, they govern how quickly your longboard turns and must be chosen when choosing your deck shape. If you are a beginner, don’t worry about choosing a specific pair of trucks for your longboard right now. As shown in my favorite longboards list at the top, I recommend every beginner buy a longboard complete – that means it comes with everything you need to start riding immediately. 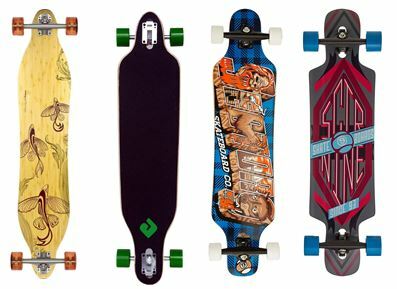 However, for riders who are looking to upgrade their current board, the trucks are one of the best value additions you can make to any longboard. The cardinal rule of choosing your trucks is to match them with your deck shape. If you don’t plan ahead, your trucks might be too flexible for your deck shape leading to the wheels being able to touch your deck while riding(this condition is known as wheelbite and usually ends with the rider falling off). If you want to know more about the role of trucks and the difference that truck width makes or reverse kingpin versus regular kingpin trucks, please see my full article on longboard trucks explained. The longboard wheels are the last major component of the longboard. While less important than your deck and longboard truck choice, they definitely affect how your longboard rides. To understand how different wheels affect your choice of longboard, you have to understand the 2 main characteristics of longboard wheels: the diameter and the durometer. The wheel diameter is important to look into because it affects how fast you can go on your board. the general range for Longboard wheel diameters is between 64 to 80mm in diameter with 70mm being the most common size. Larger wheels typically tend to accelerate slower but have higher top speeds while smaller wheels accelerate faster but have a slower top speed. Larger wheels will also be able to roll over larger cracks or pebbles in the road better than smaller wheels. 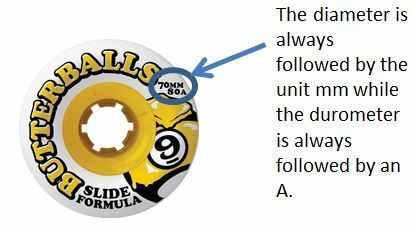 When choosing a diameter for your wheel, make sure that it will fit on your board without causing wheelbite! If your longboard has reverse kingpin trucks and wheel cutouts you should be able to fit any size wheel. However on a longboard without wheel cutouts, you will need to add a riser pad to be able to fit wheels above 70mm. Normally the diameter and durometer of the wheel are printed on each wheel as well as being in the product title. The durometer is a measure of how hard the wheel is. While most wheels are made out of polyurethane, different manufacturing processes can charge the hardness of the wheels. The higher the number the harder the wheel. While harder wheels can be faster than softer wheels, the softer a wheel is the better grip it provides you. Generally the longer your longboard, the larger and softer wheels you should have for stability. There are a number of other factors which go into choosing a longboard wheel such as lip shape, contact patch, core placement, and the different urethane formulas. If you want to explore these in more detail check out my full guide to longboard wheels.